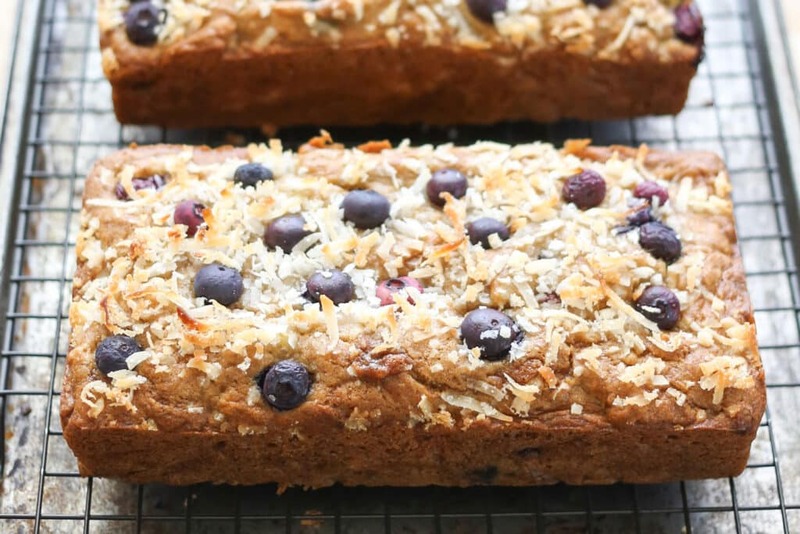 Tart blueberries and sweet coconut fill this classic banana bread. I’ve made this recipe three times now and I’m just now getting around to sharing it with you. Why the wait? It kept disappearing before I could get a picture of it. (That tends to happen when I bake at night, we can never resist the warm fragrant bread!) This time, I baked during the day, planning to freeze a loaf for another time. However, in one sitting, my crew devoured the first loaf and half of the next! To say this bread is a huge hit every time I make it, doesn’t even begin to express how much we enjoy it. The contrast of the berries and the coconut made this my newest favorite banana bread from the very first bite. Check out a few more of my favorite ways to use the season’s berries! Preheat the oven to 350 degrees. Lightly grease (2) 8"x4" loaf pans or 12-18 muffin cups. 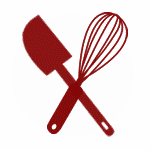 Combine the butter and sugar in a mixing bowl and beat with a mixer until smooth. Add the vanilla and eggs and beat again until smooth. Slowly add the dry ingredients, beating just until combined. Stir in the bananas and sour cream and beat just until combined. Sprinkle a tablespoon of flour over 3/4 cup blueberries and toss to coat. Add the coated berries and 1/2 cup coconut to the batter and stir gently to distribute them throughout the batter. Pour into the prepared pans or muffin tins. 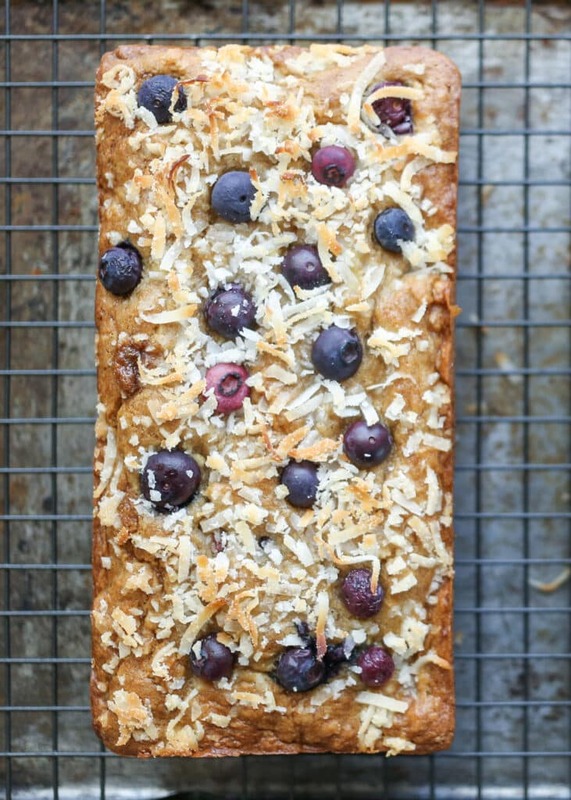 Scatter the remaining blueberries over the top of the loaves and sprinkle with the remaining coconut. Bake the muffins for 18-20 minutes or bake the loaves for 50-55 minutes, until an inserted toothpick comes out with moist crumbs. Enjoy! Oh my, this looks incredible! My kids don't like coconut yet, but I'm sure they would devour this! This is probably one of the prettiest banana breads I've seen yet. I can't wait to munch on this. I really like this bread, have made it twice, sub cardamon if you don't have cinnamon. It works fine. Do you have a calorie count or nutrition chart for this recipe. I did the non gluten, but used 1 cup brown sugar. This is my kind of bread Mary, double yum! 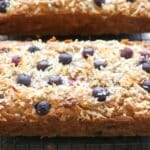 Beautiful loaves Mary - love the combination of blueberries and coconut - yum. Pinning! Can I use frozen blueberries in this recipe? I have lots in the freezer! Are you using sweetened or unsweetened coconut? This is sweetened shredded coconut. Happy baking!